I believe I can be arrested for the photo at the top of this entry, snapped as we climbed out out from DCA. It was too good a photo not to take. The White House is hidden just under the wing, but the Capitol, Washington Monument, Lincoln and Jefferson Memorials, Mall, Ellipse and most everything else you can think of for Washington is visible! I am home. My mom is now in rehab. My dad is supervising my mother’s care. I usually kvetch about travel days. Not today. Because of my mom’s condition the reservation wasn’t made until late yesterday. Helaine booked USAirway’s noon flight from West Palm Beach to Washington National then a second flight to Bradley. Spoiler alert: Everything was on-time! I fell asleep as we rolled down the runway, woke up 45 minutes later and read Rachel Maddow’s “Drift” until Sully asked me (and everyone else) to turn off my electronic gear. People reading actual books should be compelled to close them too. It’s only fair. I was in the window seat, 13F. The guy in 13D was reading a book on a tablet too! We flew the IRONS4 arrival to DCA. This is a standard approach to Runway 4. My right side window was going to have good views today. It’s a straight shot from Richmond to National flying over the spectacular Virginia countryside. From time-to-time we also flew over interesting off-the-road parcels with huge satellite dishes and radomes. I suspect these are not facilities you can drive up to just to take a peek. As I was checking my connecting gate a woman fifteen feet away tripped and fell to the floor. I ran over and helped her to her feet. Still a Boy Scout. I needed to take the bus connecting the terminals at DCA . As I was walking to the curb the woman ahead of me tripped and fell to the pavement. I helped her up too. I’m a Boy Scout and obviously a bad luck charm! 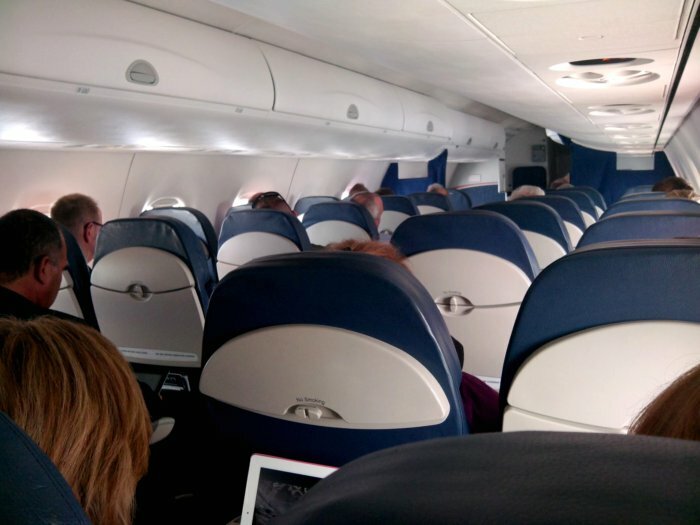 My second flight was an Embraer 175, an 80 seat jet designed and built in Brazil. Think New York City studio apartment with wings! It does, however, have a huge bathroom for a little plane. Impressive! I was in my seat kibbitzing with the flight attendant (anyone who doesn’t know how a seatbelt works in 2012 deserves whatever befalls them!) when a voice rang out from the seat behind me. Helaine tells me I have a distinctive voice. It was certainly distinctive enough for Milford Deputy Police Chief Tracy Mooney to recognize me today! Once the plane was airborne she asked me to pose for a photo with “Flat Stanley!” There is a story. Don’t ask. 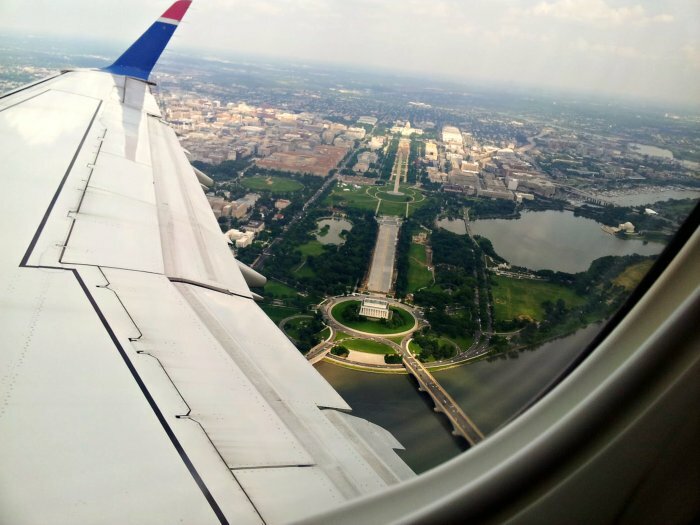 Speaking of photos, I believe I can be arrested for the photo at the top of this entry, snapped as we climbed out out from DCA. It was too good a photo not to take. The White House is hidden just under the wing, but the Capitol, Washington Monument, Lincoln and Jefferson Memorials, Mall, Ellipse and most everything else you can think of for Washington is visible! Anyway, I’m home and back-to-work tomorrow. Glad I went. Glad I’m back. Welcome home! Bet Doppler was happy to see you! 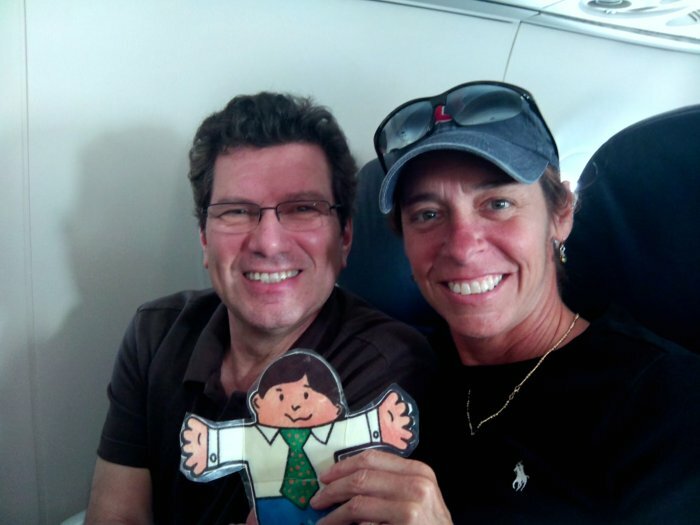 FLAT STANLEY…..My son is working on a project with Flat Stanley…we just had to mail ours off to Colorado to come back home for him….I’m going to share this blog with his teacher…I think the kids in his class would get a kick out of seeing Flat Stanley somewhere….this is fantastic…and Welcome Home Geoff..
I’ve taken several pictures from planes while in the air in 2009 and 2010. Nobody ever questioned why I was doing so. If it matters, all of my plane trips were with Southwest Airlines. I went to Chicago (2009 and 2010), Tampa (2009), Columbus [OH], the Raleigh-Durham area, Nashville and Indianapolis. This was long before the 10,000 foot mark so my phone should have been off. Funny…I was just thinking about getting my five-year-old twins into Flat Stanley. I think I’ll tell them about it tomorrow. Five days after the Columbia accident, my wife and I flew to Orlando for a Walt Disney World vacation. On our approach, we flew right over the Kennedy Space Center and I got great pictures of the two launch pads, the Vehicle Assembly Building…and the Shuttle Landing Facility where Columbia should have landed. It was sobering. I think the regulations prohibit taking pictures of crew and procedures, not scenery. I’ve taken many great shots while in the air, but always looking out the window. Never had anyone mention it to me… Maybe we’re both lucky?? Welcome home – I hope your mom is settled in now. Supervising will keep your dad busy. Glad to hear your Mom is settled in and all appears to be well. Love the picture and Flat Stanley. Many fond memories when my granddaughter sent Flat Stanley around the country. It was such a fun project for all involved. Her Flat Stan went to Mane, Virginia, Oklahoma (traveled from OK all up and down the east coast & back to OK), and Niagara Falls, NY then back to her in CT.
Glad to see Flat Stanley is still making the rounds. He spent part of the year with my Brother’s family in Ala. Went from the city to the farm, out on a cruise before he returned to CT.
Jeff: “there” is spelled their and the other “there” is spelled they’re. Sorry to correct you, but I’m really hung up on correct spelling. And “Jeff” is also spelled Geoff.